I've been intending to read something by Robert Charles Wilson for a while now, especially after Lydia Millet told me she was a fan. 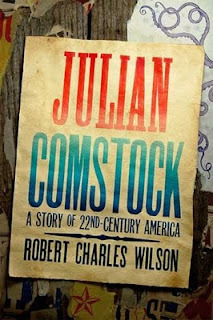 I've got a great talent for intending to read things, but my follow-through isn't always great, and so Wilson's new novel, Julian Comstock: A Story of 22nd-Century America , is the first of his books I've read. What ultimately got me reading Julian Comstock was Brian Slattery's 3-part interview with Wilson at Tor.com. I adore Slattery's work, and trust his judgment, particularly when it comes to novels about the collapse of America as we know it. I was intrigued, too, that the cover for Wilson's novel echoed the cover of Slattery's Liberation, though I've heard this was, in fact, an accident. Nonetheless, the books are similar in their portrayal of a world in which climate change and the end of cheap oil have had cataclysmic effects on society as we know it, and both books are adventure stories. Their differences lie especially in the ways they are told -- the narrative voice in Liberation is baroque and musical, the points of view slip fluidly from character to character, while Julian Comstock is narrated entirely by Julian's companion, Adam Hazzard, whose enthusiasm for neo-Victorian adventure novels has influenced his idea of what "good writing" should be and do. In Julian Comstock, with the demise of oil, America has returned to preindustrial levels of technology. The nation’s calamitous fall—involving a thorough depletion of the population and the collapse of the political system as we know it—is a hazy historical memory, replaced by a larger-feeling country, more sparsely populated and more difficult to control. The much-weakened government vies for authority with the Dominion, a huge religious organization with theocratic aims, while waging a war with a European power for possession of a recently opened Northwest Passage. Into the political, military, and religious tumult steps Julian Comstock, the nephew of the current president, Deklan Conqueror, and—inconveniently for Deklan—also the son of Deklan’s brother Bryce, the former president whom Deklan had executed in his ascent to power. Julian’s own artistic and political ambitions carry him and his best friend, Adam Hazzard, from the Midwest to Labrador to New York City, from homesteads to army barracks to the halls of power. The novel, narrated by Hazzard, is funny and sad, accessible and thought-provoking; a story of the future written in the style of the past; a light romance and a war saga; a novel of power plays and intimate friendship, where the personal is political and the political is personal. Manhattan in a spring dawn! I would have been in awe, if not for the dangers overhanging us. I won't test the reader's patience by dwelling on all the wonders that passed my eye that morning; but there were brick buildings four and five stories tall, painted gaudy colors -- amazing in their height but dwarfed by the skeletal steel towers for which the city is famed, some of which leaned like tipsy giants where their foundations had been undercut by water. There were wide canals on which freight barges and trash scows were drawn by reams of muscular canal-side horses. There were splendid avenues where wealthy Aristos and ragged wage workers crowded together on wooden sidewalks, next to fetid alleys strewn with waste and the occasional dead animal. There were the combined pungencies of frying food, decaying fish, and open sewers; and all of it was clad in a haze of coal smoke, made roseate by the rising sun. This is a paragraph that could have appeared -- at least in terms of what it describes -- in a 19th century novel. Indeed, scenes from Gangs of New York popped into my mind occasionally. Artifacts from the days of the "Secular Ancients" are prized, but by the time the novel begins, most of the useful ones have been found, and many of them have been locked away by the Dominion, which seems to consider ignorance a vital ingredient for religious faith. That the world of the novel is, indeed, so like pre-20th century America is a statement in and of itself about history and power -- the social/political structures that return include slavery and feudalism, both of which seem to be an outgrowth of numerous forces, but which fluorish because of how useful they are to the twin powers within the less-centralized United States (those powers being the Dominion and the basically monarchic-aristocratic government). The danger for the entrenched powers within such a society is that they will be undermined if that society begins to change -- this, indeed, is Julian Comstock's own hope, and there are hints that his hope is not misguided. One of the pleasures of Julian Comstock is the complexity of its political vision. Wilson does not present a monolithic, omniscient totalitarian government or some other sort of simple dystopia. The rivalry between the Dominion and the government is convincingly developed, and the country itself is also shown to have complex variations of culture, society, and politics in its various regions. There is also religious complexity -- the Dominion, which is a sort of amalgamation of various fundamentalist tendencies, is not the only religion in the land. Julian's mentor and guardian, Sam Godwin, is a Jew, though so little knowledge of Judaism has survived that he struggles to create a viable sense of faith and tradition for himself. Adam's parents are members of a barely-supported sect with a peculiar devotion to snakes. Groups of "unaffiliated" (basically illegal) churches are essential to the plot and character development in the later sections of the novel. Wilson's ability to present the political, economic, and religious complexities of his imagined world so effectively and entertainingly is among the most impressive accomplishments of the book -- there are only a few sections where the pacing falters and the story slumps, and these are easily forgiveable. The narration is so buoyant that I sometimes let the light touch of the telling fool me into thinking the book was shallow or superficial, but then, whenever I stopped reading, I realized just how vivid the world and the story were, just how much I knew about this imagined place, and I began to admire what Wilson had done the way I admire any difficult feat achieved with the gusto and flair that make it all seem effortless. "He agreed that the story lacked some essential ingredients." I cleared my throat. "Three acts -- memorable songs -- attractive women -- pirates -- a battle at sea -- a despicable villain -- a duel of honor--"
Julian eventually recognizes the value of these elements, and so adds them to the story of Charles Darwin, leading to pages where I chortled continuously as I read. Speaking of music, while reading Julian Comstock, I discovered a perfect soundtrack for it -- a gorgeous album by The Low Anthem called Oh My God Charlie Darwin (parts of which can be heard on the band's MySpace page). I listened to the album repeatedly throughout my reading of the second half of the book. In particular, the first song, "Charlie Darwin" (available via the YouTube here), which, when listened to late at night while reading the last chapter before the epilogue, will make you cry. A fine synergy -- lovely, evocative music and an amusing, thought-provoking novel. Really, what more do you want from life?